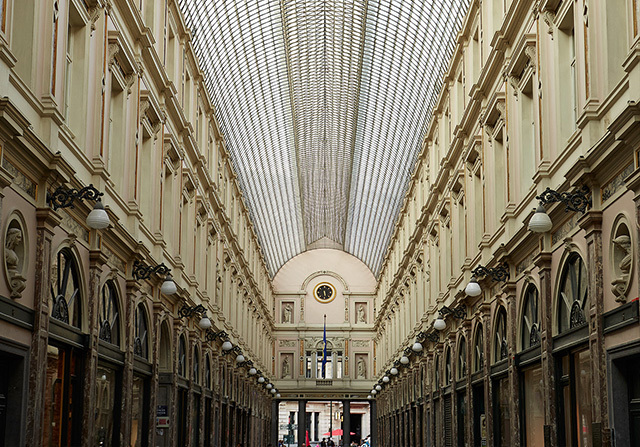 At the corner of the Galerie du Roi and rue des Bouchers, just a stone throw away from the famous Grand-Place and Manneken-Pis, the Hotel des Galeries is registered at the heart of a historic world monument, the Galeries Royales Saint-Hubert, built in 1847. This boutique-hotel with listed frontage offers a charming experience in Brussels’ emblematic city centre. The entrusted designers of the Hotel des Galeries, Fleur Delesalle and Camille Flammarion, have artfully played with luxury fabrics and contemporary colours to create an elegant yet cosy atmosphere. The 23 rooms and suites, spread out on four floors, each offer unique views of the Galerie du Roi, the City Hall and downtown rooftops, or the private patio. Located in the heart of Brussels as part of the Galeries Royales Saint-Hubert, just a few steps from the famous Grand-Place and Manneken-Pis, the Hotel des Galeries is accessible from the Rue des Bouchers, at the closest corner of the Galerie du Roi.